A firework is an explosive pyrotechnic device that is used mostly for entertainment. The most common use of a firework is as part of a fireworks display. Fireworks (devices) are made to have these four effects: They make noise, light, smoke, and sometimes produce floating materials (confetti for example). They may be designed to burn with colored flames and sparks. 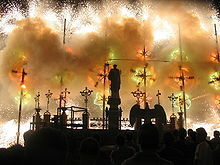 Displays are common throughout the world and are a main point of many different cultural and religious festivals. Independence Day, New Year's Eve and Guy Fawkes Night are examples. Some fireworks are ground-based, and others are shot into the air. Because they explode and can cause fires or burns, most countries have laws that only allow trained professionals to use display fireworks. Smaller, less explosive fireworks are available to regular, everyday people, but they are still dangerous and cause injuries each year. 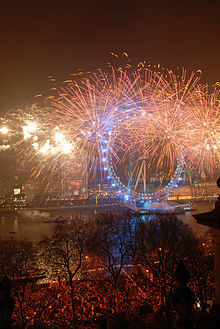 Fireworks at the London Eye on New Year's Eve. The grand finale showing also the jets that produce power. A picture taken from the back so the stars and flowers are not so clearly visible. Fireworks dates back to the 7th century and originated in China. The Chinese developed many different kinds of fireworks with a variety of effects and color. The art and science of firework making developed into an independent profession. In China, pyrotechnicians were respected for their knowledge of complex techniques in mounting firework displays. During the Song Dynasty (960-1279), many of the common people could purchase various kinds of fireworks from market vendors, and grand displays of fireworks were also known to be held. In 1110, a large fireworks display in a martial demonstration was held to entertain Emperor Huizong of Song (r. 1100-1125) and his court. A record from 1264 states that a rocket-propelled firework went off near the Empress Dowager Gong Sheng and startled her during a feast held in her honor by her son Emperor Lizong of Song (r. 1224–1264). Rocket propulsion was common in warfare, as evidenced by the Huolongjing compiled by Liu Ji (1311–1375) and Jiao Yu (fl. c. 1350–1412). In 1240 the Arabs acquired knowledge of gunpowder and its uses from China. A Syrian named Hasan al-Rammah wrote of rockets, fireworks, and other incendiaries, using terms that suggested he derived his knowledge from Chinese sources, such as his references to fireworks as "Chinese flowers". The New Year's Eve celebrations for 2014 in Dubai broke the world record for biggest fireworks display. Kazuma, Saeki (2004). Hanabi−no Hon（Fireworks Book）. Tankosha. ISBN 4-473-03177-2. ↑ Hutchins, Paul (2009). The secret doorway: beyond imagination. Imagination Publishing. p. 27. ISBN 9780981712338. ↑ Gernet, Jacques 1962. Daily life in China on the eve of the Mongol invasion, 1250-1276. Translated by H.M. Wright. Stanford: Stanford University Press, 186. ISBN 0-8047-0720-0. ↑ 4.0 4.1 Kelly, Jack 2004. Gunpowder: alchemy, bombards & pyrotechnics: the history of the explosive that changed the world. New York:Basic Books. ISBN 0465037186. ↑ Needham, Volume 5, Part 7, 489–503. ↑ "Dubai welcomes 2014 with fireworks display, breaks Guinness world record - Indian Express". archive.indianexpress.com. The Simple English Wiktionary has a definition for: firework.